Marketing Materials: What Are You Missing? 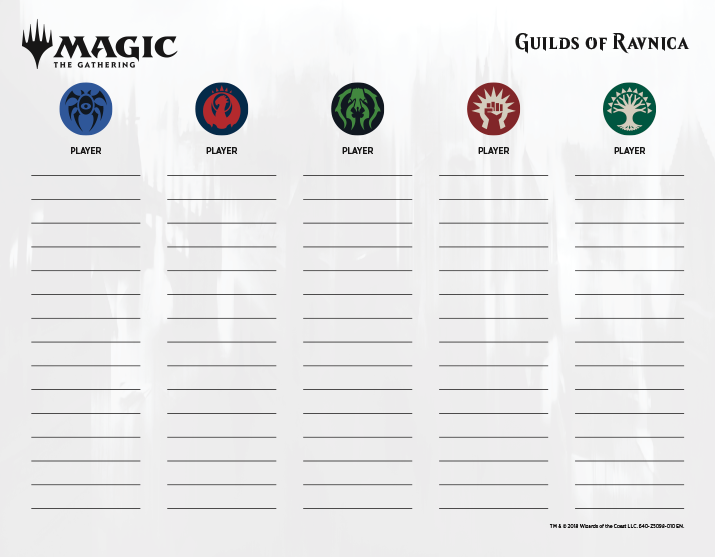 It’s up to you to decide when, where, and how to advertise Guilds of Ravnica and its accompanying events in your store. But when it comes to the “what” you can use to advertise, we’ve got plenty of help right here on our site: downloadable, customizable ads, banners, and more, created by Wizards of the Coast designers who specialize in print and digital advertising. Are you using the full suite yet? Here’s what you might be missing! Creating our downloadable marketing materials starts with strategy: identifying key product features and our goals for the set. With that in hand, I sit down with our design teams about six to nine months prior to a set’s release to decide what we’ll produce. Many items are predictable—set after set, you can expect to find product shots, logos, posters, flyers, web banners, and more. With each set, we also try new things. For example, with GRN we knew you’d want a tool to help identify Guild preferences at events. So we created a Guild signup sheet. 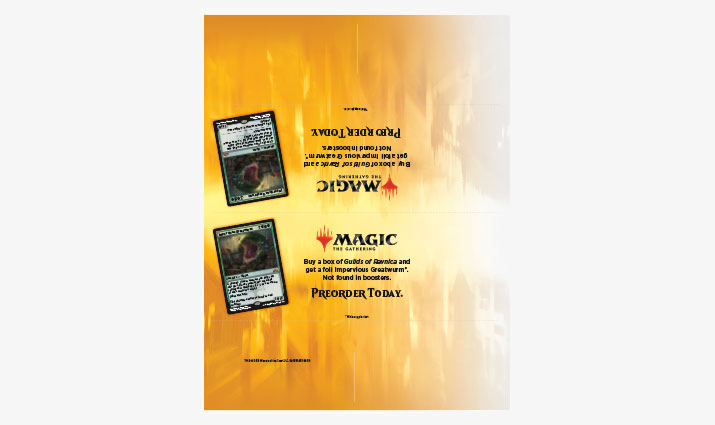 Ravnica Weekend invitations ensure you have an easy way to advertise the new mid-season offering at your Magic events leading up to November 9 to 11. Table (or P.O.S.) tents remind players about the buy-a-box card (not found in boosters). After our plans are in place, we have initial design reviews to check against the goals we’ve set, then a final design before it’s passed to localization and translated into 10 different languages. Generally about four weeks before set release, we upload the materials to share out with you. Best practices and proper sizing for digital materials evolve quickly. I strive to stay up-to-date on the most effective ad sizes and what standards would fit most broadly for our global WPN Members—and which assets our WPN members use most frequently. Take, for example, web banners. These can be used in many ways on your website as well as to get a bigger reach by using an advertising platform like Google. Whether paid or on your own website, current best practices suggest that ads are more effective when they are “above the fold” on a web page. The sizes I commission fit a standard page in most cases and cover the areas above the fold to help you get the most traffic. I also have a lot of formats created, depending on a material’s intended use. TIFF and PDF files are best used for printed materials, because of their high resolution. PNG files and JPG files are better for web use and digital applications like social media. The lower resolution file is smaller so it doesn’t cause your page to take a long time to load. Not Getting What You Need? I’d Love Your Feedback! I love seeing how our WPN members use our materials—and appreciate any suggestions you provide, whether it’s through our Retail Support team, email contacts, or via our WPN Facebook page. When I can, I accommodate requests after assets are shared. Even if ideas or concerns aren’t possible to address immediately, I always take them down to consider for future materials. When you provide feedback, let me know details about how you plan to use the requested items to help me prioritize the needs. Also, don’t hesitate to share your ideas or requests with each other via Facebook. Other folks might have solutions or similar needs. And the more retailers we hear asking for an asset, the easier it is for me to champion it into creation. 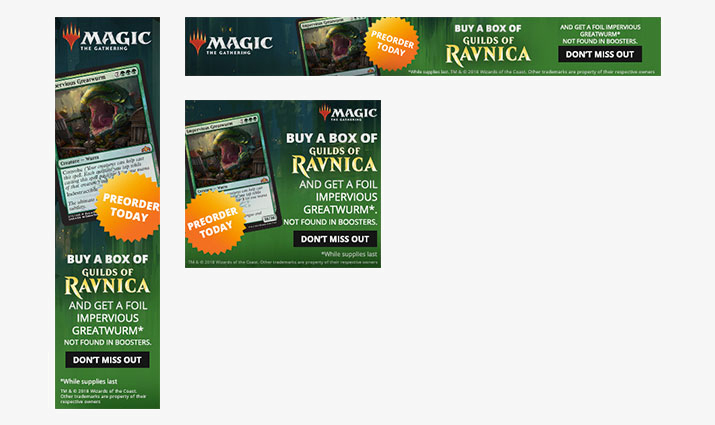 In the meantime, head on over to the marketing materials now to find what you need for advertising Guilds of Ravnica. And then let me know what you think!